Our very spacious Hanger, along with thousands of Square feet of Ramp Space, accommodates all of the aircraft we are servicing, along with long-term and short term parking. 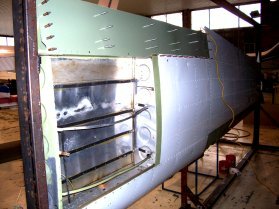 In the hanger, we have multiple separate rooms for avionics, sheet metal activities, engine repair, preparations, tools, supplies, parts room, reference room, conference room, storage rooms, rest rooms, etc. Our Ramp Space, east and south of our hanger, has tie down capabilities for most size aircraft. Numerous visitors to the airport, and most likely our hanger, during the 30s included world famous Lindbergh, Doolittle, James Haizlip, Wiley Post, Amelia Earhart, Frank Hawks, and Wallace Berry. A pilot by the name of Oliver L. Parks founded Parks College, a nearby aeronautical school, in 1927. In the mid-1930s, he became the Curtiss-Steinberg Airport operator and a business partner. One can still see the Curtiis-Wright logo in the top and center of the southern hanger side. As an interesting side note, Oliver Parks suffered injuries in a 1927 plane crash near a Jesuit seminary in Florissant, Missouri. He felt deeply indebted to the Jesuit priests, who rushed to help him in 1946, he donated Parks College to the Jesuit-owned St. Louis University. 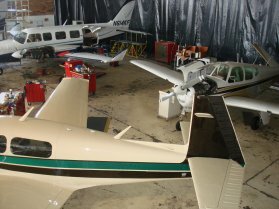 Although Parks College closed their Cahokia location in 1992, the St. Louis University flight department continues to operate a large flight school on the Airport today. 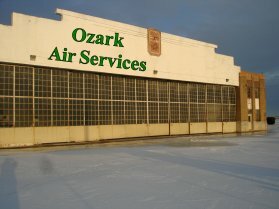 The Park's college flight school operated out of Hanger 2 (the twin hanger to the north) for many years.